I failed a save throw, crumbled and purchased one, but I still love my old 5th edition set to death! I still also fantasise about writing my own solo texts for publication (but enough about me). If you know Tunnels & Trolls please feel to skim or skip the next bit. T&T is both flexible and yet slightly flawed, but like all games which are flexible and yet flawed they beg for the invention of house rules. T&T old and new uses a fair amount of irreverent humour, brutal Troll jokes mainly. I think this irreverence comes out of the beer-n-pretzels pick-up-play/fast-play. This comes from the use of Monster Rating, and the simplistic ensemble battle rules. Room description: "In the room are 3 Dog-Wyrms (MR 30 each)." Attack: 4 Dice (d6) + 15 "adds"
Naturally, the MR system can become unstuck when you want to represent specific damage from specific weapons, armour and NPC attributes for specific saving throws and magical defences (MR doesn't always cater for these things), but through most of T&T it's accepted by players that the rules for monsters are different for ease-of-play to the more detailed rules for PCs. If all three Dog-Wyrms attacked together they'd get to roll 12d6+45 to create their Hit Point Total. 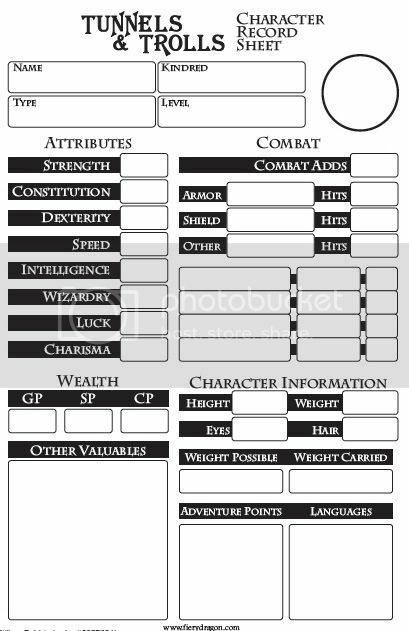 The PCs would roll their own HPT (worked out from weapon types plus "personal adds"). The highest HPT wins and the difference is damage. Damage is divided equally between the losers and then armour is deducted. Did I mention that it's d6s only? Buckets of em! The newer editions of T&T use "Talents" which will remind some players of Advanded Fighting Fantasy and more modern games like QUERP and WR&M where the players and GM can agree on invented universal skill like "Thievery" or Entertaining. Another addition since T&T 5.5 is the "Wiz" stat which is now used instead of the Strength in casting spells, making Faeries and Wizards in general a little less muscley. It's a bit like Power in Runequest. In fact one of my first home-brew/house rules in 5th edition was for PCs to have Magical Strength also well as normal strength. A really big change is the treatment of levels and Adventure Points (AP) - but I won't go into that now, and it certainly wasn't as bad as I first feared. Okay. This laptop has just run out of battery, so I'll keep this short and post some links in a bit. I'll post some links to resources and other current T&T products in a bit. I must to admit I always think T&T was a B-series game cribbed from D&D (and I don't know why I believe it was an Italian game maybe because I heard it was quite popular here in Italy in'80). Thanks to your input I find out a "new" interesting game! I see on the web other informations about T&T and now I must admit it's a very interesting game. Sometimes games feel more "local" if the packaging is low-budget, or if there's no advertising. - T&T seems to have been a much smaller franchise from the start. What was it called in Italy? A useful site which points to T&T products currently on sale from different publishers. There's quite a few amateur T&T "solos" out there, googling "Tunnels & Trolls" throws back all sorts of fan pages. I find on ebay a very rare copy of the Italian edition of T&T (for a ridiculous price ). 1. In Italy T&T was published in 1988 by a publishing house not specialized in games. 2. The 5th edition is the only edition ever published in Italy. 3. Sometimes in the book there are rough (and funny) translation errors. 4. Blame on you, Billiam... I think I'm becoming a T&T fan! You must be right, it looks very similar to the 5th edition rules as printed by Corgi books. Fantastic stuff! Looking around at a few blogs and forums, 5th edition, along with 5.5 is a preferred edition by many players, and lots of the solo texts available are written (or were re-released) for the edition you now own. I've found a nice link! Did you manage to download a copy? That file is on quite a few file-share sites, most of which have very dodgy registrations/demands for payment. I've heard of tunnels and trolls but never got into it. And now after reading that thing I'm just outright confused. How exactly do you figure out stuff like that? Might be a better starting point. thanks i'll look into that but i only ever saw it as a game for the adam.